Sony Bravia TV have a new commercial out. 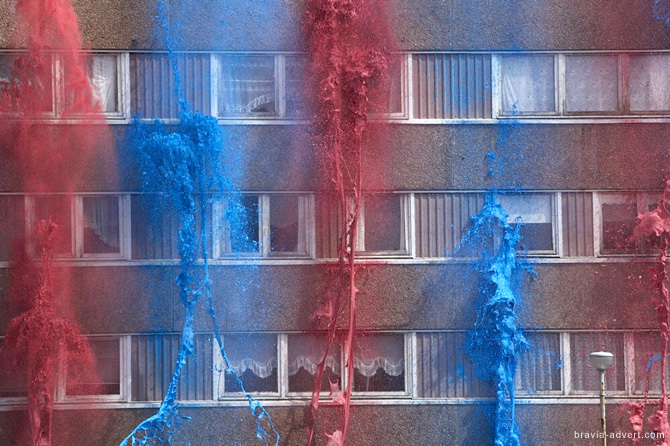 Using gallons of paint and a disused Glasgow tower block, the ad was filmed over the summer. It can be found over on their ‘blog’..
Another great ad from them, bringing home the message of colour without no other. However, whilst being able to produce a 70′ piece of film, I’m disappointed in their attempt to replicate some of the buzz that surrounded the first ad with the balls – they are doing some things but not pushing it out to where they promised it would be. The site will also feature podcasts, stills, video and text from the making of the new ad, which is understood to feature fireworks and paint in a similar way to ‘balls’, which showed thousands of coloured balls bouncing down a San Francisco street. Sony will also feed content and encourage comments on sites including dig.com, del.icio.us, Flickr.com and YouTube.tv and provide bloggers with digital cameras and access to the commercial set so they can film content for the site. All the site content will be updated daily and users can subscribe to receive notifications via RSS feeds. They have provided a lot of images and multiple versions of the ad for you to download and share (but why not a link to embed the video on my site). So they are expecting me to go sell there message – and look, I am. But I’m being short-changed. I wanted to follow the story of how the ad was put together, to feel that I could comment and participate in that process. Instead, a corporate is still spoon-feeding me but now expects me to to be part of that push process. Yes, I enjoy the ad; yes, i have brand awareness for the TV but the negatives still outweigh the positive.